Time to burn your brassieres, ladies. 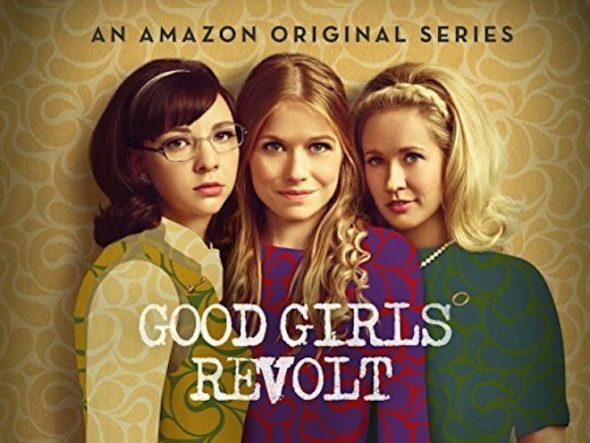 Amazon has cancelled the Good Girls Revolt TV show after one season. Genevieve Angelson, Anna Camp, Erin Darke, Chris Diamantopoulos, Hunter Parrish, Jim Belushi, Joy Bryant, and Grace Gummer star in the historical feminism drama. Writer Dana Calvo executive produces the series with Lynda Obst, Darlene Hunt, Don Kurt, and Jeff Okin. Inspired by real-life events, Good Girls Revolt is based on Lynn Povich’s book, The Good Girls Revolt. Set in 1969, the newsroom drama follows female researchers at News of the Week, who request fair treatment in the workplace. The ten episode first season just dropped to Amazon on October 28, 2016. THR reports Sony Pictures Television has big plans for season two and will shop the show elsewhere. In other words, there is still hope for more. Sources say streaming monitor Symphony Advanced Media metrics had Good Girls Revolt collecting more viewers than many of Amazon’s other originals. Sources say Amazon Studios head Roy Price was not a fan of the series and didn’t deem it to be an awards season player in opting to pass on ordering a second season after hearing Sony’s season two pitch this week. The studio had hoped to file on time for a California tax credit. What do you think? Have you watched the first season of the Good Girls Revolt TV series? Should Amazon have cancelled or renewed it for season two? Don’t cancel this in the midst of the #metoo movement! The strides women have made in the workplace needs to be front and center right now. This show portrayed women’s’ struggles in the 60’s in a beautiful and inspiring way. Really ticks me off. Reconsider please !! It is a Fantastic series!! How ironic a single minded man cancelled this series! Considering some of the “garbage” on Amazon Prime a second season of GGR would have made a lot of sense when deciding on programming. Could have done without the immorality but the story was award winning quality.